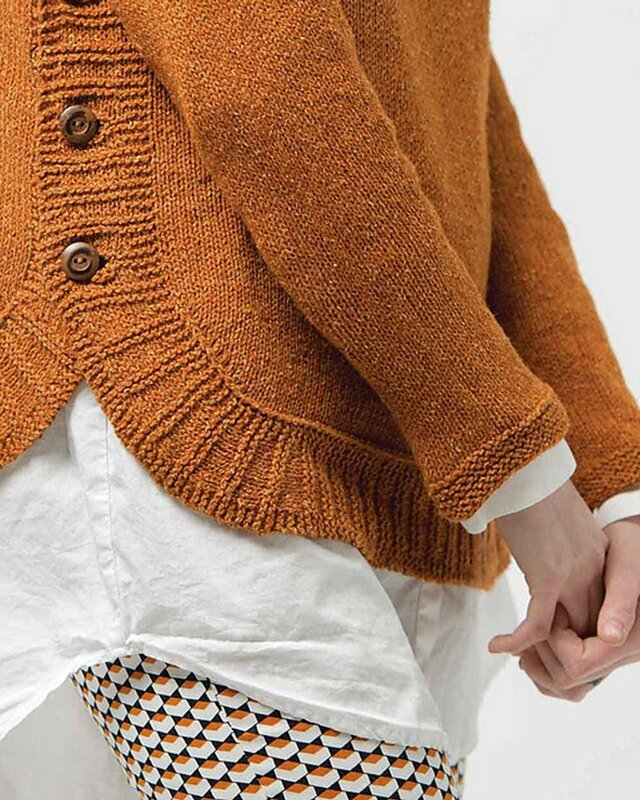 Taken from: Knitting Short Rows "Buttonside Sweater" - Boxy and swingy, Buttonside uses German short rows to shape the shoulders below the textured saddles, the curved hems, and the sleeve caps. The textured garter stripe edging that borders the sides and hem is worked along with the body until the hem shaping, then applied seamlessly using additional short rows to curve smoothly around the corners.. This pattern is from Knitting Short Rows, pg. 81, "Buttonside Sweater". Size US 5-32" and 16" circular needles (or size needed to obtain gauge) are required but not included. Notions required but not included: 2 stitch markers, smooth waste yarn, and yarn needle. Finished Bust Measurements: 34.25 (36, 40, 44, 48)" after blocking. Gauge: 22 sts and 28 rows = 4" in St st.
Yarn shown is Elsebeth Lavold Silky Wool in color Pale Ale. We do not currently carry this yarn, but Berroco Remix Light is a great substitute!